So..... kind of a big week for us. After a big huge fight (happily married people fight? yes.) that spanned a day-and-a-half, Dan and I made peace and right on time to head to my doctor's office five minutes late for little baby's first (and hopefully only) ultrasound. This brings me to my first reason I love my doctor and his ways. 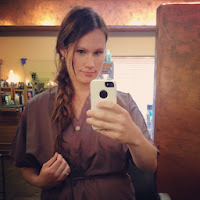 He doesn't do ultrasounds all throughout the pregnancy unless they are medically necessary. I'm iffy on the fence about the long term affects of ultrasound technology on our precious little babies while they are swimming around in amniotic fluid. Not saying ultrasounds are bad, but what if 30 years from now we learn something??? I mean, they used to do radiation as x-rays before they knew better... Anyway, I'm glad it's just one, and I'm glad it's at 20 weeks and not earlier, so they can get a good solid look at everything. I'm not jealous of all y'all who come home with rolls of sonogram pictures after every. single. office. visit. just because you wanted one and your doctor said ok. Although, to be clear, if it were medically necessary for me and the little melon to undergo additional ultrasounds, I wouldn't hate that I got to see more pictures. Low and behold... there's a BABY in there. A squirmy one with a beating heart and huge feet and a handsome profile that looks just like Penny. The gender you ask? Yes, we know. We weren't planning on finding out in the exam room (we were gonna do the envelope thing), but in the car on the way there we decided it was no big deal and we should just look. It was... elating... I cried... and then it was... ho hum. Like, now I know. And it's wonderful to see and know... and the day goes on. We have planned a big informal gathering to reveal pink/blue tonight, so I won't say anything here and now except that last night I had all kinds of dreams about crazy names we might choose for our offspring and our families' (negative) reactions to them. I awoke with anxiety. This is one reason why we will not be talking names with anyone besides each other until we've written something on a birth certificate. Another reason I love my OBGYN's office? Everyone there and everything they do is one hundred percent pro-woman, pro-dignity, pro-sanctity of life. They walk the walk of truly dignifying women's bodies AND all human life by not participating in any practices that may hurt any patient that comes in, or the new life growing inside of her. Their approach to well-woman care, prenatal care, fertility AND infertility... and anything else that comes... all of it: Pro-life. No embryo discarded, no patient disregarded. You can't say that about many ob's these days. I feel good and I feel safe when I go in there, knowing that where I'm at is a part of the culture of life. It's important to me that I feel safe and at peace when I spend time with the medical team that is overseeing my pregnancy and birth. Every woman should feel one hundred percent comfortable with her medical team when she's pregnant, whatever her reasons are for preferring one practitioner or midwife over another. Stepping down from soap box now. The other big news this week? As you can see from the insta-before and insta-after, I got my hairs done! Holler! Big friggin' deal you say... To that I tell you it's been just over six months since my girl Kim got her hands on my locks and oh did they need some love. Not sure if you noticed but I've been rocking the braid a lot... that's because my hair was so gnarly I couldn't get a brush through it. It was so long I couldn't reach the bottom of it even if I had wanted to brush it down my back. We cut off four inches today and it's still long. Oh, and I'm going blonde. Well, maybe. We went pretty light today and I'm planning to go lighter again in 4 weeks. The best part was that I got to spend three hours by myself. In a salon that smells like Aveda. I don't feel entitled to this, but when it comes around I sure do appreciate it, especially when it's been since last October. Can you tell I'm excited? OK I'll stop with the hair talk. Mmmmmm my hair smells so good. OK that was it. 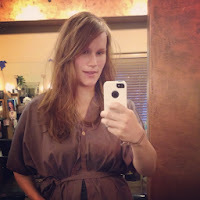 I ramble about my hair because all I want to do is tell you if I am having a boy or a girl. Next time my friend, next time. Love the hair. Love the ultrasound. Love the blog entry. Totally agree with you on the U/S! Had only the 1 scan with my second baby and never felt the need or want for more and never felt any jealousy over other people's ever so many scans.